Taken this past October. We were standing on the coast of Hudson Bay hoping the fox would come our way. We had no idea it would run right up to our boots. 600 f4 was a little too much after this shot. Wonderful action capture with three feet off of the ground and super eye contact. Great image, Michael. that is way there is no such thing as a perfect lens but in your case only one capture is needed, it's a beauty MICHAEL. Lovely head on approach shot and catching this movement with three of those dainty paws off the ground just makes the image for me, Michael. 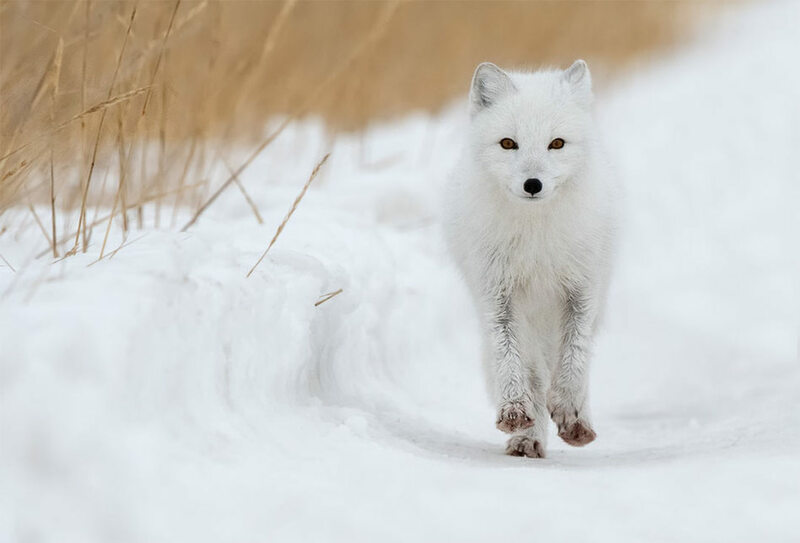 Oh, my- how absolutely beautiful-so well framed and so exciting to see this fox running right towards you. Love it! Location: San Francisco Bay Area, CA. Fabulous image Michael, wonderful eye contact, dof and framing.